We can offer you a range of vehicles to suit your specific seaport transfer needs for luxury, comfort, style and relaxation. Choose from an S Class Mercedes to an E Class Mercedes. Whether there are only two of you or a group, we have the perfect executive chauffeur driven seaport taxi for you. All our executive chauffeur drivers are experienced and know the best routes to get you to your destination as quick and safe as possible. Portsmouth is the second largest city in the ceremonial county of Hampshire on the south coast of England. Portsmouth is notable for being the United Kingdom’s only island city. As a significant naval port for centuries, Portsmouth is home to the world’s oldest dry dock still in use and also home to some famous ships. 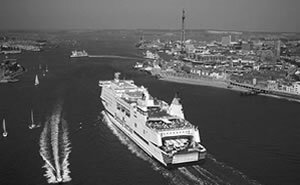 For executive seaport transfers to all major UK seaports including, the Port of Portsmouth, Cars Exec can help.